Meanwhile, the Al Mezan Centre for Human Rights has recorded the stories of the lives of every one of the 556 children killed during Israel’s 2014 assault on Gaza. 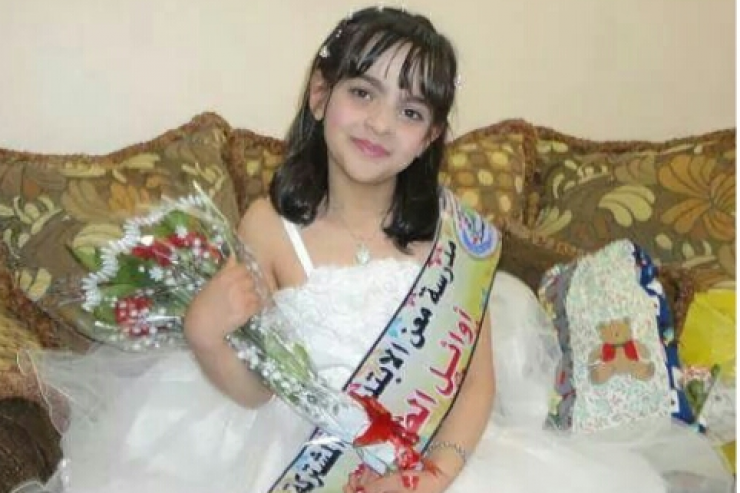 Eight-year-old Yara from Khan Younis was a small innocent girl described as an ‘angel’. She was an outstanding student at school. She was a daring and independent child, making her own decisions. She also wrote and drew beautifully. Her teachers keep some of her paintings. She won many art competitions. Her ambition was to be a dentist. Yara was very elegant, and was said to have good taste in choosing and combining colors. “She told me that she did not want to grow up, and I was very surprised to hear that from her,” said her mother. Her mother says that, “destiny quickly made her wish come true,” leaving her with deep sadness. But she hopes that her daughter is in heaven. On 1 August 2014, the family home was targeted with a missile from an Israeli drone. The family started to evacuate. Yara and her siblings were targeted by another missile while they were running away from the house. They were killed on the spot. so painful to look at that child! As you blogged a while ago: some weeks, some days just wear one down. Yes, Marmee, when I first read about her, it made me cry.